This is my favorite way to serve green beans at Thanksgiving and I've been making it for years. 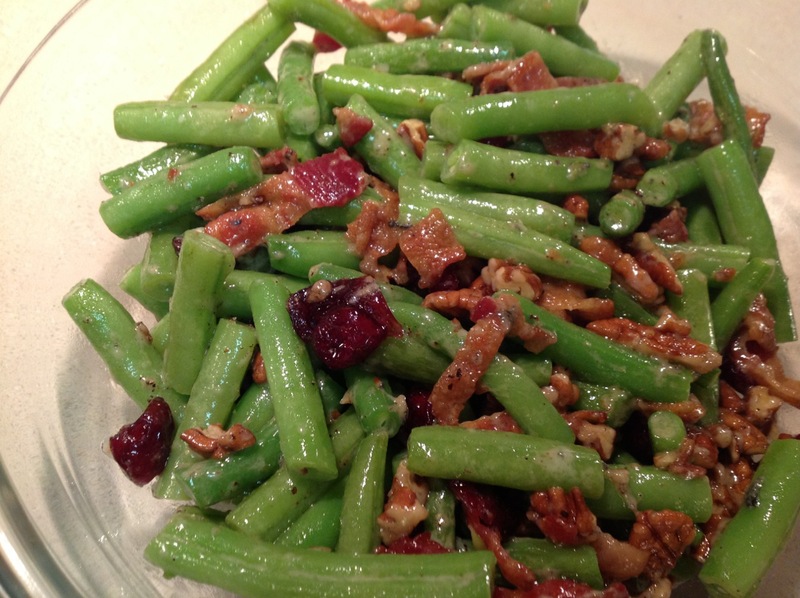 Green beans and bacon are a natural pair, and the coating of melted blue cheese works well with both. This year I experimented with dried cranberries, which adds a nice sweet dimension. Certainly, omit any of those ingredients if you are vegetarian, nut-allergic or (oddly) opposed to blue cheese. 1. Heat a large pot of salted water to boil. Cook the green beans about 2 minutes. Drain the beans and then put them in a bowl of ice water to quickly cool. 2. While the water boils, heat a large frying pan over medium-low heat. Toast the pecans a bit until fragrant. Remove from pan. Increase heat to medium. Fry bacon until bright red and crispy. Remove from pan and chop into bits about 1/2-inch wide. Drain off all but about 2 tbsp. bacon fat from pan. Drain green beans and sauté in pan about 2-3 minutes. Add the blue cheese and stir to combine as cheese melts. Stir in the pecans and dried cranberries. Season with fresh-ground black pepper. Opposed to blue cheese? How is that possible?